Het Finse Wärtsilä is een samenwerking aangegaan met het eveneens Finse AW-Energy om de WaveRoller verder te ontwikkelen. Met de WaveRoller technologie kan golfenergie worden opgewekt. Oceanen en zeeën hebben ongekende mogelijkheden voor duurzame energieopwekking. Wärtsilä en AW-Energy willen er samen voor zorgen dat er meer projecten worden gerealiseerd, waar de WaveRoller wordt ingezet voor duurzame energieopwekking. De bedrijven hebben op dit moment verschillende projecten met een gezamenlijke capaciteit van ongeveer 300 megawatt waar aan wordt gewerkt. WaveRoller is a device that converts ocean waves to energy and electricity. The machine operates in near-shore areas (approximately 0.3-2 km from the shore) at depths of between 8 and 20 meters. Depending on tidal conditions it is mostly or fully submerged and anchored to the seabed. A single WaveRoller unit (one panel) is rated at between 500kW and 1000kW, with a capacity factor of 25-50% depending on wave conditions at the project site. The simple yet very powerful idea for the design of WaveRoller came in a moment of enlightenment when Finnish professional diver Rauno Koivusaari was exploring a shipwreck. He noticed that a very heavy flat piece of the ship’s body was moving back and forth, driven by the energetic under-surface surge of water, the ocean waves. Since that first moment of insight the WaveRoller design has gone through multiple cycles of building prototypes, testing them in laboratories, conducting highly sophisticated simulations and numerical modelling, and finally deploying the test devices in the real ocean environment to make observations, adjust the scale and repeat the development cycle. WaveRoller behaves in essentially the same way as the flat part of the wreck that Rauno observed. The back and forth movement of water driven by wave surge puts the composite panel into motion. 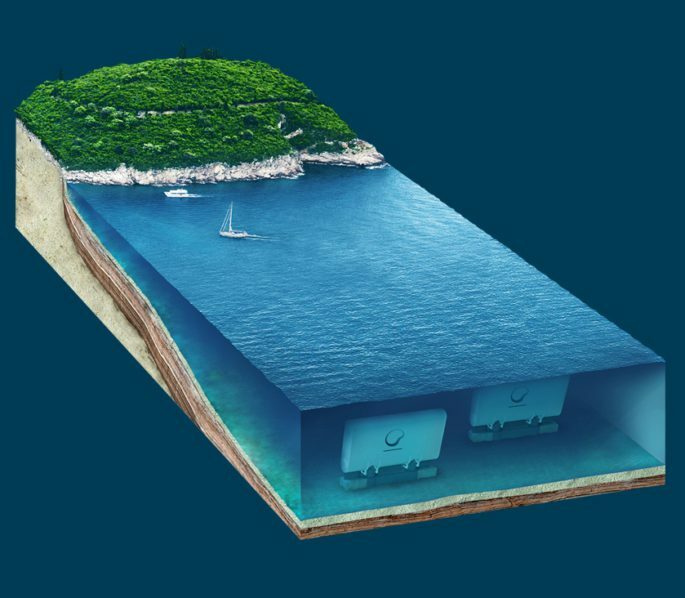 To maximize the energy that WaveRoller panel can absorb from the waves, the device is installed under water at depths of approximately 8 – 20 meters, where the wave surge is most powerful. The panel spans almost the entire depth of the water column from the sea bed without breaking the surface. This ensures that the panel does not protrude onto the seascape and prevents the creation of material inefficiencies that would put additional load on the structure. As the WaveRoller panel moves and absorbs the energy from ocean waves, the hydraulic piston pumps attached to the panel pump the hydraulic fluids inside a closed hydraulic circuit. All the elements of the hydraulic circuit are enclosed inside a hermetic structure inside the device and are not exposed to the marine environment. Consequently, there is no risk of leakage into the ocean. The high-pressure fluids are fed into a hydraulic motor that drives an electricity generator. The electrical output from this renewable wave energy power plant is then connected to the electric grid via a subsea cable. The power output from a single WaveRoller device, or in other words output from a single panel, ranges between 500 and 1000 kW. The differences in power production result from the local wave resources. When multiple WaveRoller devices are installed at a single site, we talk about wave farms or arrays. These farms can include tens of devices, so that part of the infrastructure of the site is distributed among the machines, thus reducing the cost of an individual unit. Since each WaveRoller is equipped with an on-board electricity generator, the output from many devices can be combined via electricity cables and a substation. Large wave farms have nominal capacity of a utility-scale power plant. Wärtsilä is introducing a new portfolio of tug boat designs, dubbed the HYTug series, that make use of the company’s hybrid propulsion technology and were created with “environmental sustainability” in mind. The new designs all make use of the recently introduced Wärtsilä HY hybrid propulsion solution — which provides a degree of energy efficiency and operational flexibility that should prove useful to those working in regions with tight regulatory requirements.